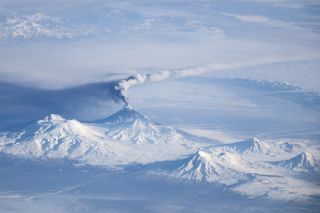 This photograph provides a view of an eruption plume emanating from Kliuchevskoi, one of the many active volcanoes on the Kamchatka Peninsula, as seen by an astronaut on the International Space Station in November 2013. NASA has opened voting for its TournamentEarth 2014 photo competition, which takes Earth images captured by satellite and makes them go head to head. Users (that's you!) vote on the best shots, which then go on to the final round. You can create your interactive bracket here. Note: Voting ends Friday, March 14. Our favorite to take the whole thing: An eruption at Kliuchevskoi, a stratovolcano on the Kamchatka Peninsula of Russia (above) was photographed by the Expedition 38 crew aboard the International Space Station.